Genuine HP 15 Black 17 Colour Ink Cartridges are high-yield ink cartridges that are a compatible option for popular printers such as the HP DeskJet 810C and 812C models. 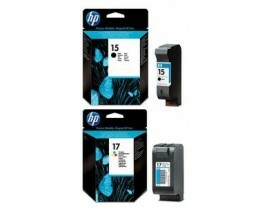 These Genuine HP 15 Black 17 Colour Ink Cartridges are manufactured for use in the Hewlett-Packard DeskJet 840C series, and can yield up to 495 pages of high-resolution printing. Combined to cover your black, white, and tri-colour needs, these ink cartridges produce smooth transitions and defined edges with precisely layered micro-fine drops for aesthetically pleasing documents. They are engineered to quickly dry, reducing the chances of smudging. Plus, installation is a breeze, requiring a simple insertion of the cartridge while the printer does the rest. For those looking for an eco-friendly aspect, these cartridges are qualified for the HP recycling program upon depletion.